Pat Cummings is a successful children’s author-illustrator with a long, distinguished career. 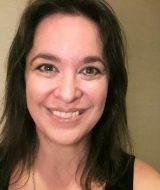 In children’s-YA writing and illustration, maintaining an active publishing career is arguably an even bigger challenge than breaking into the field. Reflecting on your personal journey (creatively, career-wise, and your writer-artist’s heart), what bumps did you encounter and how have you managed to defy the odds to achieve continued success? I’d freelanced for a couple of years before graduating from college, filling my portfolio with posters and flyers from children’s theaters. That imagery plus my love for storytelling made children’s books seem like a logical pursuit…until I talked to my professors. Every last one of them insisted it was absolutely, completely impossible to break into the industry. Don’t even consider it, they said. One professor even told me to forget about illustration altogether. 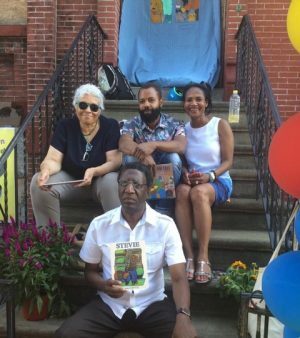 At the dedication of John Lewis Steptoe Place in Brooklyn with author-illustrator Javaka Steptoe, author Jerdine Nolen and author-publisher Wade Hudson. That advice could have been the first and potentially large bump in the road for me, but their comments barely registered. I was in my twenties and convinced that I could do whatever I wanted to do, largely because my parents had always made it clear that my sisters and brother and I were expected to follow through on whatever we set out to do. That attitude led me to sit through an entire semester of Calculus waiting for enlightenment, despite concept after concept zinging over my head, never once landing. That class taught me that, sometimes, it is wise to jump ship. Did I really want to be a rocket scientist? No. But illustrating? 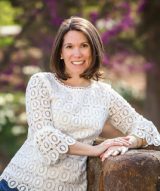 I was finding enough clients coming out of school…between theatre, magazines, and ad agencies…to know that what I loved doing could also pay the rent, so I just kept working and pursuing publishers periodically. In those days, the 1970s, publishers would see you in person. 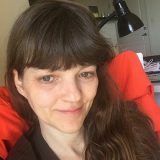 I made a lot of mistakes…my portfolio was crammed with way too much disconnected work, and my record-keeping was so sloppy that I’d turn up at an editor’s office I had visited only two weeks earlier. You actually met with clients in those days. I was in and out of so many offices in Manhattan that I knew where all the bathrooms and newsstands were. And I learned to develop a billing system because I did so many small jobs every week that I’d lose track of jobs I hadn’t been paid for or, even worse, bill again for ones I had. 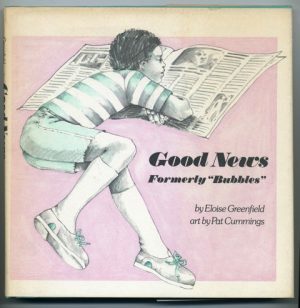 When I got my first book to illustrate, Good News by Eloise Greenfield in 1975, I had no idea how to begin. An editor had seen my work in a newsletter and got in touch to say she had a book she wanted me to do. It was mine if I wanted it. I had seen someone at her publishing house before, and it was only when the editor called that I realized that seeing one person doesn’t necessarily mean you’ve seen the right person. I found that there could be lots of editors in the big houses, and while one may have been mauled by a cat as a child and would never want your cat story, the person in the next office might adore cats. Having learned to appear confident and competent with my freelance clients, I pretended that I knew what I was doing when the editor gave me Eloise’s manuscript. But I was clueless. Fortunately, I thought, I knew somebody who knew somebody who knew somebody who used to date the picture book illustrator Tom Feelings. So I called him up cold and asked for help. He graciously walked me through an impromptu ‘How to Do Your First Picture Book 101,’ telling me everything I’d been hesitant to ask the publisher. Eloise, I heard later, thought the little boy in the story looked too much like a girl. Having used my niece as a model, I could see her point. And to my horror, when it was published in 1977, I could also see all the eraser marks and the inconsistencies I hadn’t noticed. Initially, the picture book stories I wrote were rambling stories about talking houseplants and alien abductions. It took a while for my fifth grade teacher’s advice to kick in: Write about what you know. When I let go of the notion that to be published I’d need to come up with nothing short of The Wonderful Wizard of Oz [by L. Frank Baum (1900), I started writing about funny things from my childhood or stories I’d overheard about kids I knew. Loosely inspired by Pat’s brother. Jimmy Lee Did It (Lothrop, Lee & Shepard, 1985) was the first picture book I’d written after about ten books that I’d illustrated only. The rhyming story about my younger brother’s imaginary friend took about half an hour to create. I had lived it. I just had to put it down on paper. It was something of an epiphany to realize that kids like to read about how other kids have handled the universal experiences of childhood. By the time I wrote Clean Your Room, Harvey Moon (Aladdin, 1994), I had learned another important lesson: Don’t use your brother’s real name in a book if you want to avoid legal action. As the only boy in a family of three girls, he’s inspired at least five books. Another epiphany: Books about boys getting into (and out of) trouble do well. I’ve jumped around, doing books that fall into different genres. I’ve done board books, illustrated chapter books, textbooks, nonfiction, middle grade and even a teen novel for a packager. Taking on projects that are outside my personal comfort zone of picture books always teaches me something new about the industry. I think most people of color are expected to stay in their lanes. Sci-fi and fantasy, adventure stories…I remember when publishers were less enthusiastic about seeing work in those genres from us. Pat with art directors Laurent Linn and Cecilia Yung. 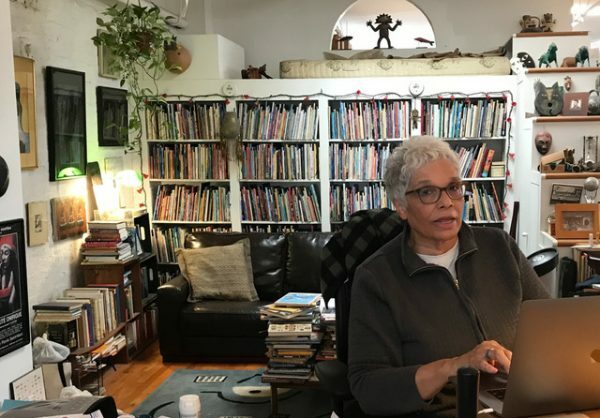 “Our” lane seemed to be limited to folktales, history (often about slavery) and gritty tales that explained how it felt to be a person of color facing racism. Usually, the protagonist overcame adversity in some noble way that would leave white readers able to see themselves as being on the side of the righteous. 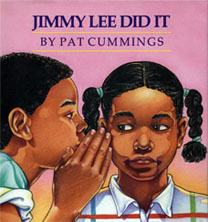 It has always been my intention to create books peopled with African American children. The percentage of picture books with diverse characters is still a small percentage of the overall number published. 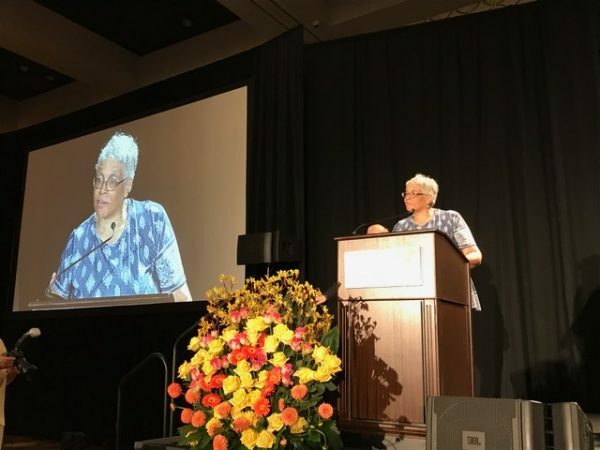 It’s important to me that black children–children of all colors, races, cultures and identities–can find themselves in their books. But recently, I listened to a white male writer-illustrator talk about his work and acknowledge that he’s free to do stories about any culture, as long as he does the work required to authentically represent it. He described this as a privilege he doubted people of other races enjoyed. That set me thinking. It seems to be yet another bump in the road. I once did a series of Chinese New Year’s cards for UNICEF and was told I couldn’t be credited because my name wasn’t Chinese…so the cards wouldn’t be considered authentic. I can only guess whether that criteria would have applied to a white male artist. Having grown up in a military family, living in Asia and Europe as a child, I know I want the world for my palette, to have access to any imagery or any story that appeals to me artistically. I’ve incorporated characters from other races in my books but that writer-illustrator’s words made me think. I think about the story tucked in my files based on a fascinating character in Indonesian history…and the Spanish folktale that I want to dust off one day. In any career, at any stage, there will be bumps in the road. But there’s something curiously challenging about facing roadblocks that need to be hurdled. 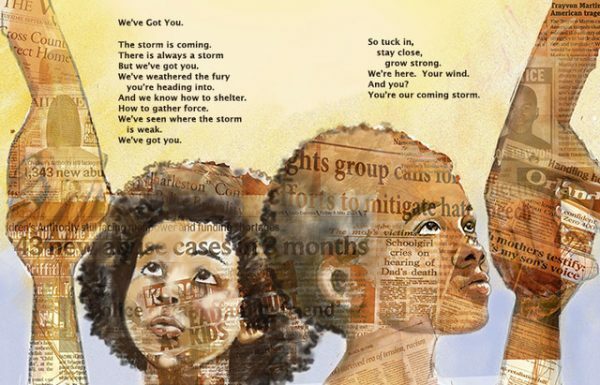 Interior from We Rise, We Resist, We Raise Our Voices, edited by Wade Hudson & Cheryl Willis Hudson (Just Us Books/Crown, 2018); used with permission. If you had it to do all over again, what—if anything—would you do differently and why? I think I’ve made the right choices based on whatever information I had at the time. I might go back and tell myself to work faster and harder but I don’t think I’d change anything. Even down time was constructive. All of the lessons I’ve learned can be distilled now into pointers I can offer my students or to writers and illustrators in the workshops I do. But I don’t think I’d even skip over the horrible jobs, the ones that had me wanting to chew off a leg to be done with. They’ve all been instructive. • Trust your gut. Show your stories to others, follow your storylines, don’t ever tell yourself, “You can’t.” Because, believe me, there are plenty of others who will do just that. Try to tune negativity out. • Put yourself in your books. I love traveling. 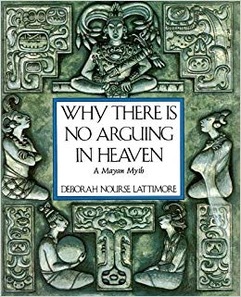 But it wasn’t until I came back from Guatemala, from climbing temples in Tikal and went to an ALA gathering where I saw Deborah Nourse Lattimore’s book Why There’s No Arguing in Heaven (Harper, 1989), about the gods of Tikal, that it occurred to me to blend my travels into my books. A really Duh! moment. I could travel and put it in a book. 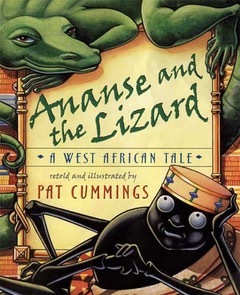 Ananse and the Lizard was the direct result of that little epiphany. And all of the shopping I did in Ghana, gathering reference material, legitimately counted as tax deductible. I think. • Learn to negotiate and value your time, energy and talent at least as highly as the client who is trying to profit by using your work. • Keep learning. Stay curious. Take on work that makes you nervous. If you’re not slightly panicked by the blank page in front of you, you may be getting too comfortable. • Know that every book will have your imprint. Like an accent or handwriting, your books are uniquely you. I’m always concerned with what the core message is that young readers might take away. And I’ve done a complete 360° about books needing to be “deep or educational.” If a book is entertaining or encouraging or humane or compelling it may be just the experience a child needs when they happen to fall into your story. • If you’re not having fun, you’re not doing it right. All lofty goals aside, whenever I listen to speakers at conferences whose work I admire or talk with friends who are producing books I love, I’m struck by how much their book means to them. They are telling stories that they find exciting or amusing or compelling and meaningful. 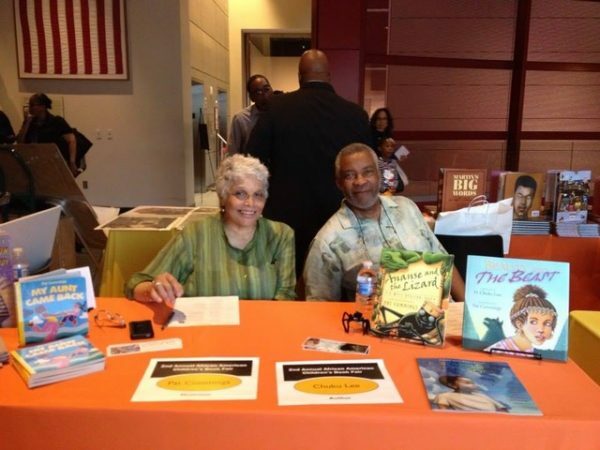 Pat signs with her husband, H. Chuku Lee, who wrote the retelling of Beauty and the Beast that she illustrated (Harper, 2014), at the African American Baltimore Children’s Book Fair. The field and body of literature are always evolving. For you, what have been the stand-out changes in the world of children’s-YA writing, illustration, literature and publishing? What do you think of them and why? One disheartening change I’ve witnessed is the proliferation of celebrity books. I thought the trend had hit a crescendo when Madonna started writing and refusing to have the illustrator credited on her covers. But so many celebrities have rushed to tell stories that they claim, “Nobody was telling,” that I realize these books are with us to stay. Stars with big audiences from television, instagram, or Hollywood will keep churning out picture books as long as publishers need to sell books…and big names can deliver those sales. However, the increase in “own voices” stories is encouraging and pretty exciting, if not long overdue. Also, there’s more of a clear-eyed embrace of a child’s reality in picture books than when I started. Children don’t live on bunny-infested, sweetly-envisioned islands that float apart from the “real” world. Books like Where the Wild Things Are [by Maurice Sendak (Harper & Row, 1963)] were groundbreaking simply for admitting that kids get angry. Their inner, emotional landscapes are no less complex than adults, but picture books that honestly addressed those emotions weren’t always so available. So that’s good news. What advice would you give to your beginner self, if that version of you was a debut author-illustrator this year? I’d tell myself to embrace social media and to overcome my natural impulse not to constantly market my books. Social media is the new book tour, the new marketing department, that publishers once seemed to be working diligently to promote your book. I think I’d tell my beginner self that creating the book was only the beginning, that there was work ahead to get it into readers hands and hearts. I might also warn my over-booked younger self to recognize my physical limitations. It took me years before I would push back on over-scheduled presentations at schools, libraries and conferences. I was taking four trips a month for years, all over the country, sometimes waking up and not being sure what city I was in. Or I’d find myself on duty from 7 a.m. with a Teachers’ Coffee till 11 p.m. at night following the Friends of … dinner and a public program, always after a day talking to several hundred or even a thousand kids. Note: The kids were always fabulous. But it took several years to recognize that the adults who planned these events might want to milk every second of a visit if they thought it would maximize the per diem they were paying. So I think I’d tell myself to say “no” occasionally. And definitely to get everything spelled out and agreed to up front. I remember being in Sicily on a book tour of Italy and meeting a YA author who’d arrived in tears. She’d landed with no one to meet her, didn’t speak Italian and was an hour away from the venue without even knowing where she was headed. She had trusted the organizer to just “be there.” By that time, I had learned to nail down every detail of a visit before I left home. I’d also tell myself to relish the success of others. That there’s no point in comparing your work to others. If ever I’ve thought, Why didn’t I get in that show? or How did that book win an award? I’ve tried to remember that someone else might have thought that about my book and it leaves me feeling happy to be able to do this work, to have a seat at the table–period. All those years ago, when Tom Feelings showed me how to get started, I wanted to find a way to let him know how much I appreciated his help. But Tom said, “Just help someone else when they need it.” That attitude really permeates this business and I can’t imagine another one quite like it. So many people are so genuinely helpful, through organizations like SCBWI and workshops like those at the Highlights Foundation. All of the editors and art directors and agents I know are always on the lookout for new talent. So I would tell my beginner self: Trust that there’s a place for you, too, at the table. What do you wish for children’s-YA writers, illustrators, and readers, looking to the future? I’d simply hope that writers and illustrators would work on stories that are meaningful to them and that they’ll clear all obstacles in their way to do that. The number one issue I encounter when I go to conferences or give workshops, even in my classes, is fear…fear that work will be rejected, fear that the work isn’t this or that perfect thing that publishers are looking for. So, I’d want everyone to do what they love and not obsess with it being the book. It’s enormously satisfying to do what you love. Contracts, awards, even letters from young readers (“I rely lik yor buks!”) are wonderful. But if they are your goal, it would be wise to recalibrate. Books have allowed me capture stories about my family or places I’ve traveled or to investigate things about which I’m curious. And they’ve let me explore places I might not have visited without a book to research or promote. I’ve researched castles in Spain and listened to African storytellers under the stars. When I look on facebook, I see friends posting photos from their school visits in Dubai or conferences in Paris. That’s what I wish for others who are interested in creating books for kids: that you get to follow your curiosity wherever it takes you and let yourself create work that will resonate with strangers you may never meet. When I toured Japan a few years ago I was able to meet up with former students from my Children’s Book Illustration class at Parsons. 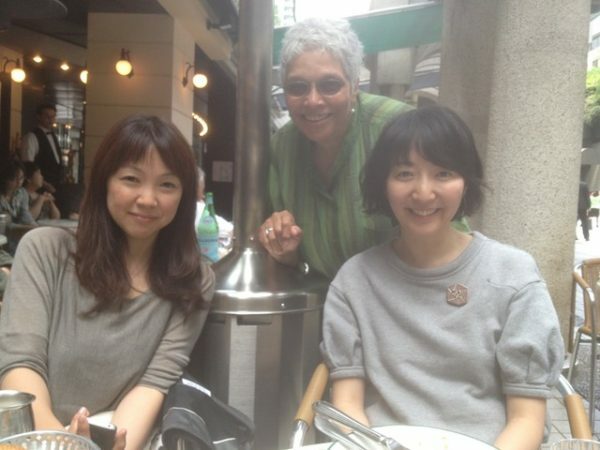 This picture was from a lunch I had with Hiroe Nakata, on the left, and Naho Ogawa. Hiroe knew she wanted to do picture books. 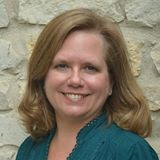 She created at least two projects per semester when she was in class. And Naho has done everything from gallery exhibits to magazine work to picture books. She met me with four picture books she had written and illustrated, published in Tokyo all at once, unlike how books might be published here. As a writer-artist, what do you wish for yourself in the future? My latest book is a middle grade novel, and I’ve been entirely, completely seduced by so much room to tell a story. 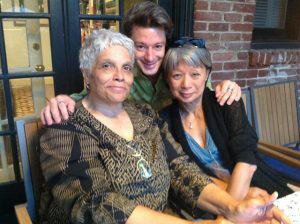 I only got it done by forming a writers’ group. Meeting with those friends monthly gave me a self-imposed deadline to move the story along. Lots of pressure. And now, I find I just want to write more. Diane Dillon’s birthday, cutting her cake with Susan Straub, Donna Grant (left) and Faythe Weaver (standing). As the pictures show, Our Writers Workshop (OWW) seems to focus a lot on food, but we actually do get some writing done. 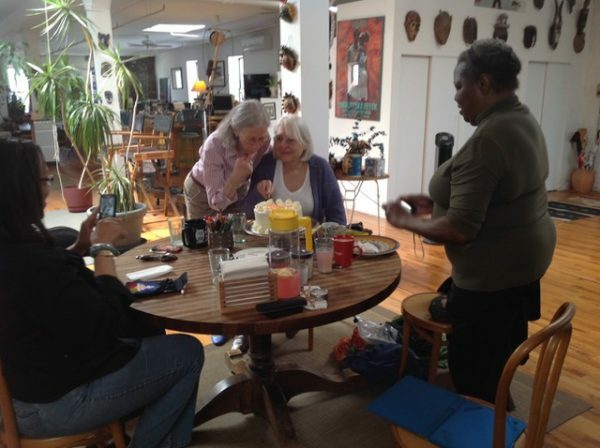 The first photo was from a meeting at my loft in Brooklyn where we celebrated Diane Dillon‘s birthday, cutting her cake with Susan Straub, Donna Grant on the left and Faythe Weaver standing. 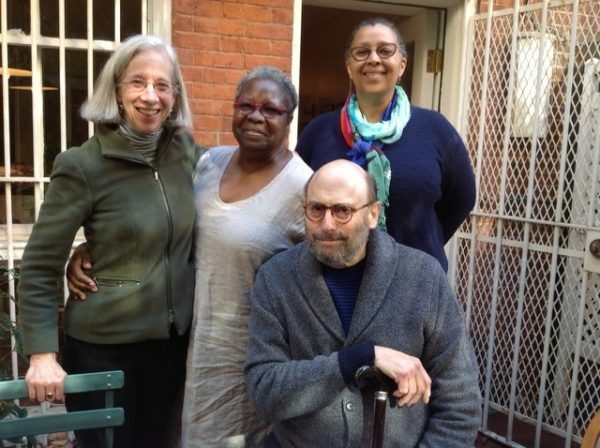 A meeting at Susan’s, with Faythe, Donna and the rare visitor to our meetings, Susan’s husband, novelist Peter Straub. Having a group of writers whose opinions and goodwill I trust really made the difference between wanting to write a novel and getting it done. Working alone, it’s easy to become isolated or distracted, so I highly recommend finding like-minded friends to help you stay focused. I have two books coming out this year. 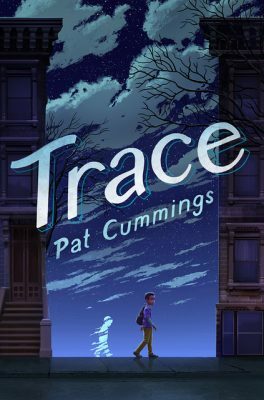 Trace is a middle grade story (complete with a ghost!) 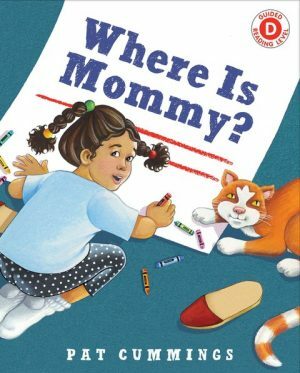 from HarperCollins, and Where is Mommy? is a picture book from Holiday House due out this fall. Both were absolutely exciting to work on. Both were torture. Every time I finish a book, putting away every scrap of reference and cleaning up my workspace, I’m convinced that it’ll be a long time before I put myself through that again. Then another story starts brewing. Or one of the snippets of a story that I have filed away in folders that fill nine storage boxes, floats into mind. The Survivors Interview Series offers in-depth reflections and earned wisdom from children’s-YA book authors who have successfully built long-term, actively-publishing careers.